If you’re a regular at the Ferry Plaza Farmers Market, you’re no stranger to the green and white California Certified Organic Farmers (CCOF) signs that hang at a number of our sellers’ tents, assuring you that the farm’s practices meet national organic standards. 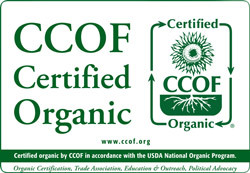 This year, CCOF celebrates its 40th anniversary, having grown from a small grassroots coalition of farmers to the largest organic certifier in the United States. “A small group of people who are committed to making things better can do an amazing amount,” says Grant Brians of Heirloom Organic Gardens, who currently sits on CCOF’s board and is the only original CCOF member remaining. 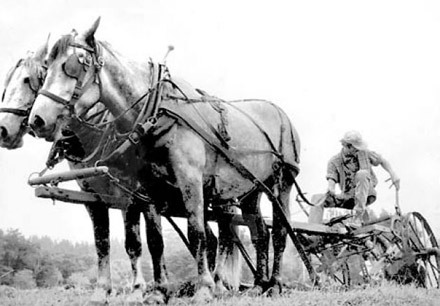 Other founding members include Jerry Thomas, who started Thomas Farm in 1971, and Warren Weber (pictured above on a horse-drawn plow) of Star Route Farms, which has been continuously certified organic since 1974. Organic standards have come a long way since the 1970s, thanks to the efforts of such pioneering farmers. In 1971, Rodale’s Organic Gardening and Farming magazine started the country’s first organic certification program in California, in response to a surge of interest after the first Earth Day. However, in February 1973, Rodale announced to its 90 organic farmers that it was discontinuing the program, when they “quickly realized the task was beyond their ability,” according to Thomas. Reluctant to abandon certification, 54 of those farmers decided to start their own certifying body, CCOF. Without Rodale’s support, CCOF struggled at first. In the days before cell phones and email, farmers scattered throughout the state found it difficult to stay in touch and drive hundreds of miles to attend meetings. Some farmers dropped out. In 1975, CCOF’s officers decided to establish regional chapters, starting with the Central Coast chapter, to allow farmers to meet and network locally. For the first 12 years, CCOF was a volunteer-run certification program. Members inspected each other’s farms using guidelines derived from Rodale’s Encyclopedia of Organic Farming. “We treated it almost like the organic Bible,” recalls Thomas. CCOF’s first newsletter, published in 1974, listed only 13 rules for the CCOF Standards of Farm Certification. Brians, who started farming at age 14, was eager to inspect farms when he first joined CCOF but had to wait until he was old enough to get his driver’s license. During the 1970s and ’80s, he was a prolific farm inspector, the certification chairman for his chapter of CCOF, and a member of the state certification board. He found farm inspections to be “amazing opportunities for learning” and for sharing his knowledge. “A good third of the time, I was dispensing advice and information,” he says. 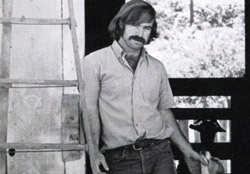 In 1985, under the leadership of then-president Weber, CCOF opened an office in Santa Cruz and hired its first paid staff person, Mark Lipson (who now serves as Organic and Sustainable Agriculture Policy Advisor at the USDA). Two years later, they hired their first executive director, Bob Scowcroft. According to Cultivating a Movement: An Oral History of Organic Farming & Sustainable Agriculture on California’s Central Coast, when CCOF ran into financial difficulties during this period of growing pains, a $10,000 donation from The Grateful Dead helped it stay afloat. By 1987, CCOF had 15 chapters; the organization had grown along with the organic industry, and with this growth came a need for more standards and enforcement to prevent fraud. The group worked with Congressman Sam Farr to pass the California Organic Foods Act of 1990, which added enforcement to the legal definitions of organic practices established in 1979. Also in 1990, the Organic Food Products Act was included in the U.S. Farm Bill, calling for the establishment of the USDA National Organic Program (NOP) and the National Organic Standards Board. CCOF’s rules were used as a foundation for NOP standards. Learn more about the history of CCOF. Thomas Farm can be found at the Saturday and Thursday markets, Heirloom Organic Gardens at the Saturday and Tuesday markets, and Star Route Farms at the Saturday market.